The vernal equinox is upon us and with it brings the start of spring! 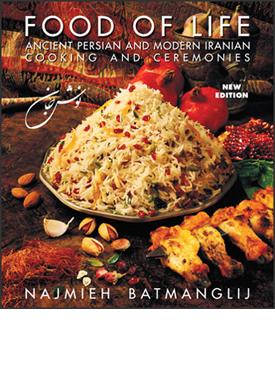 It is also the beginning of the ancient Persian New Year celebration of Nowruz, and on this week’s A Taste of the Past, host Linda Pelaccio is talking to the “guru of Persian cuisine,” cookbook author, and culinary educator Najmieh Batmanglij all about the history and food traditions of the holiday. Having just baked a batch of baklava, Najmieh goes on to share the meaning behind certain dishes and that are vital to a proper celebration. After the break, Linda and Najmieh delve into the essential ingredients to Persian cuisine and how many date back thousands of years. Rounding out the show, it is discussed that Nowruz is not a secular holiday, rather a celebration of the Earth for everyone to enjoy. Tune in for a wonderful show! This program was brought to you by Cain Vineyard & Winery.